Your Private Provence keeps groups small (7 max) to ensure relaxed, and personalized tours. Pick-up will be at 10:30 am at the Avignon TGV train station. 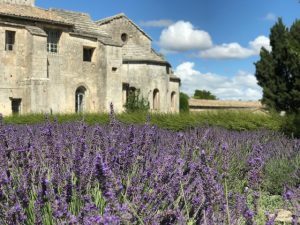 From the train station, we’ll drive 30 minutes to Saint Remy de Provence to explore two of Provence’s most intriguing historical elements: the Roman era and the time Van Gogh lived in Provence. After enjoying lunch together in the quaint town of Saint Remy, you can stroll through the town for some boutique shopping and photography. Transfer to our 4-star hotel in L’Isle sur la Sorgue around 3:30 pm with relaxing time until we meet up in the evening for a walk through the town and dinner together at one of your guide’s favorite restaurants. 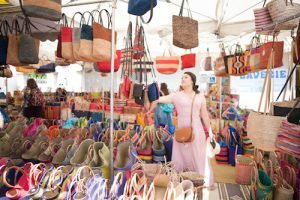 Perhaps you have heard about the market in L’Isle sur la Sorgue – famous for its antiques as well as one of the best Provencal markets in the region. You will have the morning to explore the market at your leisure. Lunch today will be at a private home in a small village with incredible views of the valley. Chef Giusepinna will treat us to Mediterranean cuisine at its finest. We’ll then take a scenic Provence lavender route leading us to the colorful village of Roussillon. Here, the ochre pigments, in shades of red, yellow, and orange, mix together to create a stunning backdrop both in the village and in the countryside. Dinner will be on your own in L’Isle sur la Sorgue (the hotel is in the heart of the town so easy access by foot to all restaurants at your leisure). The core of Provence and its culture has always been centered around wine. You will be treated to an exceptional wine tasting experience in Chateauneuf-du-Pape to give you a greater understanding of the history and winemaking process in the South of France. Lunch will be part of the wine tasting experience. Before returning to the B&B, we’ll head north about 15 minutes to Orange for a tour of the majestic Roman Antique Theatre. Dinner together this evening in L’Isle sur la Sorgue at another one of your guide’s favorite restaurants. Lavender and Lavandine are two different varieties of Provence lavender. 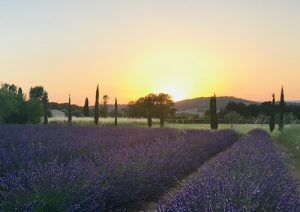 A lavender tour to Provence would not be complete until both are discovered. We will go to the higher elevation lavender plantations around Sault to learn the essential aspects of the two varieties and the distilling process. Lunch will be picnic style at one of the lavender farms. Return to the B&B around 5:30 pm with free time until we meet for our group dinner in the heart of L’Isle sur la Sorgue. We’ll start our day with one of the most photographed emblems of Provence, the Abbey de Senanque. 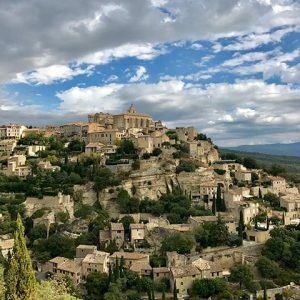 From here we’ll visit the stunning hilltop village, Gordes. Discover how this village came back to life starting in the late 50s. Lunch will be shared together in the village. In the afternoon, we’ll explore the water source that feeds the Sorgue river (the river that flows through L’Isle sur la Sorgue). 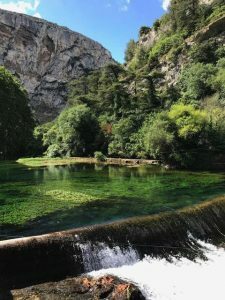 This source is found in the village of Fontaine-de-Vaucluse and it’s always a pleasant walk next to the crystal clear waters and shade of the 100-year-old plane trees. Return to the B&B around 5:30 pm. Dinner at your leisure this evening. Today is the end of your Provence Lavender & Cultural Tour but before we part our different ways, we’ll tour the historic center of Avignon and have our farewell lunch together at a favorite restaurant near the Popes Palace. Return to Avignon TGV train station (drop-off at 2:30 pm). *please note that a glass of wine is included in your package price. Should you decide to order more wine (or other drinks), this is at your charge directly with the restaurant. Your Private Provence suggests arriving in France before day 1 of the tour. Why not stay a couple nights in Paris and then take the TGV fast train from Paris to Avignon to arrive by 10:30 am. 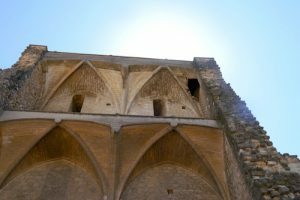 Or come to Avignon and stay a night or two before pick-up on the group tour. If staying in Avignon before or after the tour, I suggest staying at Le Cloitre Saint Louis or Grand Hotel Avignon – pickup/drop-off can be arranged at these hotels. This sounds like a wonderful time. We are trying to plan a trip to France and I would love to experience this in addition to our trip. Bonjour Barbara, This would be the perfect trip for the traveler wanting to experience France with a guide before or after doing your own thing. I’ll be emailing you soon with more details. This tour sounds fab I emailed earlier in error about July but very keen for June 2019.